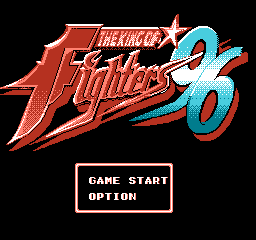 A bootleg version of The King of Fighters '96, except it plays more like Street Fighter II. 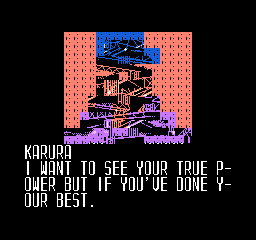 The game was supposed to have cutscenes, but only two remain functional through hacking, albeit without graphics. The text for some of the removed cutscenes can still be found in the ROM. 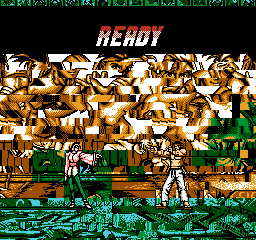 To access the two cutscenes while playing the game, change the value at RAM address 40 to 0C (cutscene before fighting Chizuru) or 0E (cutscene before fighting Goenitz). The cutscene will play after seeing the intro again. Most likely a leftover from using that game as a base and was never intended to be used. Interestingly enough, the way the stage tracks line up with the stage order in the address should imply 02 has no music track related to it. 01 has track 6 from the NSF which should mean 00 has track 5 and 02 has track 7...but 03 uses track 7 instead. All of the other stages afterwards line up with their tracks properly. It's possible that even in the original version, 02 was an unused stage. It's highly unlikely this was intended for this game but Hummer Team did port over Final Fight 3 to the NES where this does appear in the intro. A generic JY Company easter egg is still present inside the game. 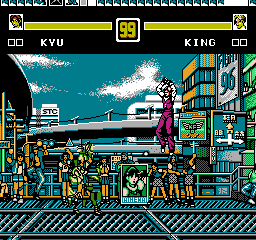 At the title screen, press Down, Down, Left, Up, Right, Left, Up, Down. Just like the other unused cutscenes above, this one is missing actual CHR data. It can't be found anywhere inside the CHR-ROM. It seems to be the full-screen JY logo used in most games they publish. This page was last modified on 1 December 2018, at 07:00.